Showplace offers a unique combination of design flexibility, product quality, expressive creative options and honest real-world value that you will find in no other home cabinetry brand today. Each cabinet is a product of the pride and personal attention that can only come from a company where every employee is an owner. Showplace employees are all personally invested in what they create for you. Every cabinet Showplace creates is made right here in America, but they also select from the best sources anywhere on earth, like Austrian Blum hardware, and lovely, renewable exotic woods. Showplace was founded on the belief that other brands had become too complicated, too limiting, with too many hidden costs. Showplace and Sierra Remodeling’s approach is straight-forward, honest, and simply makes sense. Come into our Sierra Remodeling showroom and we’ll design your new Showplace kitchen with all the storage solutions you envision. We may even surprise you with new functionality you never dreamed of too! Your Showplace dealer: get your project started right! Planning a kitchen or bath remodel? That’s an ambitious goal! Unlike furnishings or decor, cabinetry is a lasting, permanent part of your home. It can also be an important factor in future resale value. It’s important to make good decisions, that you’ll be happy with for a long time. Sierra Remodeling, your Showplace dealer, can help you do just that. Showplace cabinetry is right at home throughout your home. From wall-beds and bedroom cabinetry, to laundry rooms, dining settings, bathrooms, living rooms, family rooms, reading rooms, wet bars, wine caves and recreation rooms — your creativity is your only limitation. Showplace and Sierra Remodeling are your one-stop shop for consistent and quality cabinetry throughout your home! This video presents several case studies from actual homes. Featured are Showplace display cabinets, bookcases, fireplace surrounds and inset cabinets, custom room dividers, tall entertainment centers, bedroom desks and organizers and bath vanities. Your new cabinetry creation should be an expressive reflection of you — your tastes, your values, your personal style. To do this, you need a cabinetry brand that offers the wide range of creative options to make such personal expression not only possible, but easy. 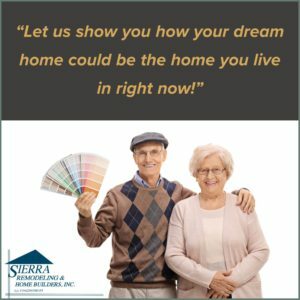 Sierra Remodeling and Showplace will hold your hand through our design process to ensure your visions come true! You and Sierra Remodeling want quality you can count on, and Showplace gives you just that. Compare Showplace construction features to other cabinetry brands. We think you’ll agree that Showplace gives you a lot more for your money. And Showplace stands behind this American-made quality with a limited lifetime warranty. Your new Showplace cabinetry creation can go wherever your imagination leads. Because with Showplace cabinetry, you have the wide range of choices and true custom options to craft a uniquely personal creation in your home. Sierra Remodeling and Showplace have lots of resources you can use while planning that new creation. We offer information, ideas and inspiration. This video gives you an overview of these valuable resources that are online at the Showplace website.